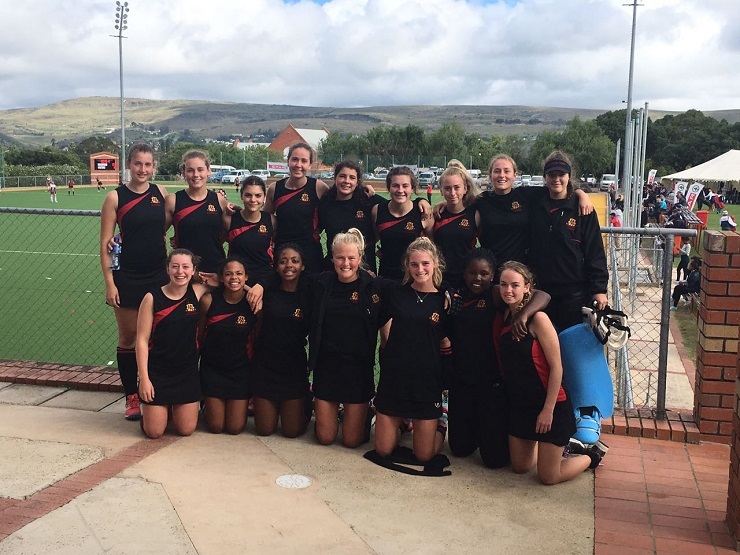 Kingswood became the first team to qualify for the SPAR Eastern Cape Schoolgirls Hockey Challenge provincial finals when they won the PE North tournament in Grahamstown on Saturday. Playing on their home astro, the Kingswoodians defeated Brandwag 1-0 in a well-contested decider to earn the right to attend the provincial finals at Woodridge, just outside Port Elizabeth, in August. The Schoolgirls Hockey Challenge is played throughout the Eastern Cape and Southern Cape, with schools meeting in five regional tournaments to decide the finalists. The next tournament takes place at Westering in Port Elizabeth on Wednesday when the PE Coastal edition is held. Under new coach Bevan Bennett, it turned out to be a satisfactory day for the host school. “We are just at the start of our season, but this was a really good exercise for us as we set out to work on our strengths and to find a pattern for our game this season,” said Bennett. He added that Kingswood had to work hard in the final against Uitenhage side Brandwag, with Megan du Preez scoring the winner. “Brandwag play a very direct and physical game so we knew it would be a real test in the final. Bennett said the day had been another success for all seven schools who participated. “It was a very good start to the season and there was a great vibe throughout the tournament. He felt it also set up Kingswood nicely for the season ahead. “It was a very good starting point in terms of getting some sort of game-plan sorted for the season. Kingswood showed their intent from the beginning when they defeated Cradock High 4-0 in their opening encounter. They went through their six matches unbeaten to comfortably qualify for the final. Brandwag had a rather tougher route. They lost to Kingswood and Cradock, but had two draws and two wins to finish on 11 points, taking second place. The top two sides in the league phase of the tournament contested the final. SPAR EC sponsorship and events manager Alan Stapleton said it was a great “bully-off” to the Hockey Challenge. “These events tick off all the boxes of SPAR’s sponsorship drive where we can reach all of the communities which we serve,” he said. He added it was encouraging to see the family support and the intense competitiveness of the matches, but which were still played in a sporting and friendly spirit of camaraderie. “It was just sad that Union, last year’s winners, were not able to participate, and that DSG could not field their full strength side.